She strolls into the center of the room and strikes a pose, staring straight into the camera as if she’s daring the audience to start something. She does this a lot; it’s just Bathia being Bathia. The opening today is all about establishing that this crazy bag lady has access to the secret magic number of the universe. She roams around the foyer, staring off into the corners. This is apparently her way of warming up. She pauses for dramatic effect, and then says, “A woman!” as if there were a huge number of options left. Okay. Jeez. You brought it up. “There are more to come,” Bathia says. Apparently she’s still taking tricorder readings. Then there’s a great little moment — just for an instant — where Bathia’s giving another weird speech, and Natalie rolls her eyes. Grayson Hall is not accustomed to being the second most eccentric person in the room. And then — wait, really? I think I want to hear more about that story. What guy had the courage to break up with you? Meanwhile, Joshua goes up to the tower room to check on things. 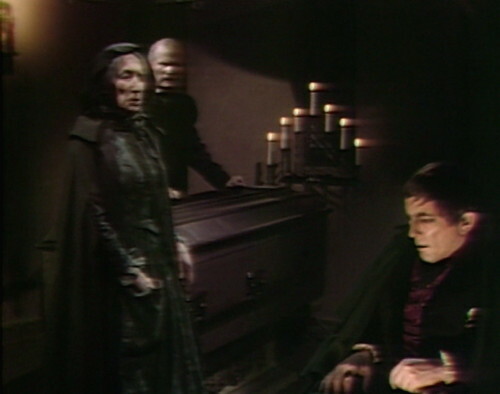 Bathia was right, of course — Barnabas has left the building, and Joshua finds the recently-bitten Millicent, now in full-on Ophelia mode. She giggles and babbles as if she had just arrived from New York. The house is descending into utter chaos. Joshua returns, and asks Bathia to find his missing son. This has got to be the weirdest service call she’s ever been out on. Then something happens that brings it all into focus. Bathia: You have not told me everything about your son. Joshua: I have told you — all you need to know. Bathia: Why do you not trust me? That can make me fail. There is something you must tell me, before I can begin. Joshua: Must I say the word? Bathia: I fight an enemy that I must call by a name. What is it you have not told me? And it turns out that here — smack in the middle of one of the strangest episodes we’ve had so far — this is the key to the entire show. Because he has to tell the truth. It won’t work otherwise. He has to swallow his pride, and stop keeping secrets. It’s one of life’s most basic lessons — tell the truth, admit you’re wrong, trust people, ask for help — and yet we have to learn it over and over, like it’s a surprise every time. This has been the problem for the entire storyline. 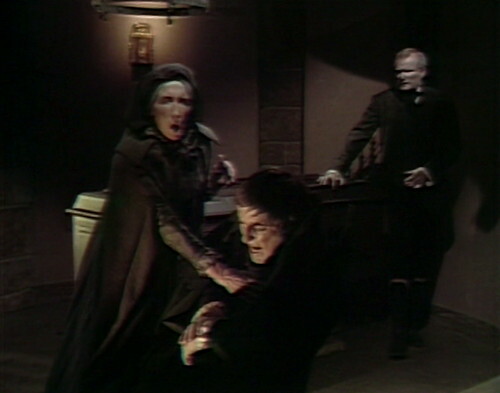 Barnabas had a secret affair with Angelique. Josette and Jeremiah didn’t tell anyone about what was happening to them. Joshua made up a cover story that Barnabas went to England. 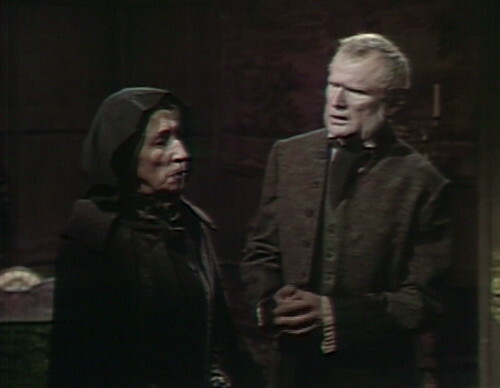 Barnabas didn’t explain his plans to Josette. At every step, the Collins family of 1795 has chosen to lie, to obscure, to keep things secret and avoid a scandal. If Joshua wants to break this cycle, he needs to start telling the truth. Just say the word. Joshua: My son is a vampire. Finally. Now we can get somewhere. 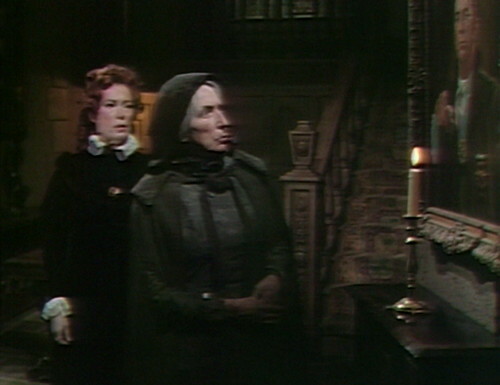 So Bathia makes another incantation over a candle, sending the flame out to find Barnabas, wherever he is. It turns out that he’s at the docks, of course, because that’s what he does when he feels troubled about something — he goes down to the docks to kill a prostitute. He doesn’t really need to. He bit Millicent earlier this evening, and he’s just been moaning about how terribly guilty he feels. But he sees another girl, so all of a sudden he’s thirsty again. Because Barnabas’ thirst for blood has nothing to do with “hunger”, as we experience it. 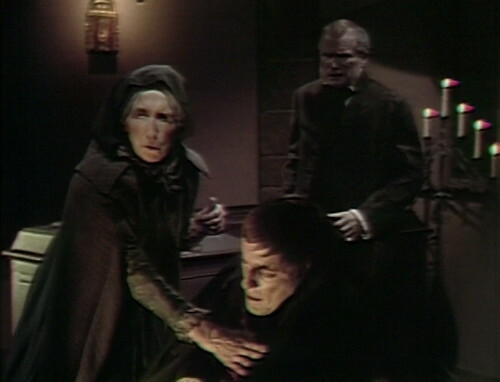 There isn’t a specific amount of blood that Barnabas needs in order to maintain his existence. His “need” is just a craving; he bites people when he’s feeling stressed or scared. And this cycle is getting increasingly self-perpetuating. If he bites this woman just for the momentary comfort it brings, then he’s taking the risk of being exposed, plus now there’s one more killing to feel guilty about. This is clearly spiralling out of control. 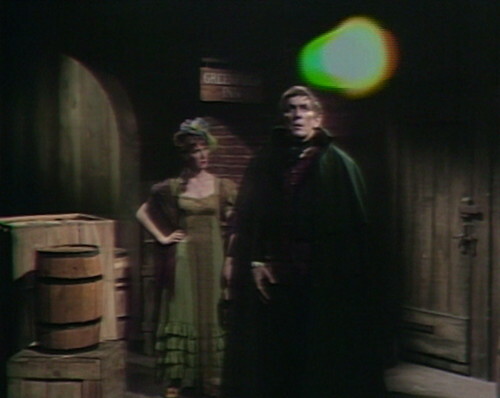 But then Barnabas sees the light. Literally, there’s a light, and he sees it, and it helps him make the right choice. This isn’t made explicit, but you could interpret this scene as a crucial spiritual moment for Barnabas. If he ignores the candle flame and rejects Bathia’s help, then he’s lost forever. In the end, he makes the right choice. Obviously, it’s weird to congratulate a guy for not killing his third prostitute, but you have to start somewhere. 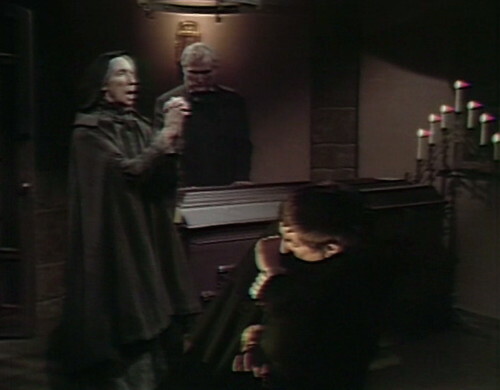 Things get pretty heavy when Barnabas shows up at the tower room. At this point, Bathia explicity confirms the spiritual subtext. 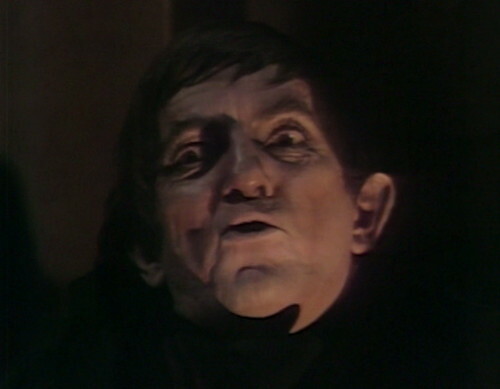 Barnabas: What are you going to do to me? Bathia: I’m going to fight her who put the curse on you. Your body, your mind, your soul will be my battlefield. Tell me her name! He starts to choke — just as he’s choked so many other people — but her touch helps him to spit out the name: Angelique. “There must be a witness,” Bathia says. Because this isn’t really a fight between Angelique and Bathia, a woman that we can’t see and a woman that we’ve just met. The real enemy here is the lie, and the only solution is for Barnabas to take responsibility and confess his sins. Of course there needs to be a witness. These secrets have been destroying them all. And then, believe it or not, the scene gets even weirder. Clasping her hands together, Bathia paces around Barnabas, drawing “a circle of faith” that will protect them as she draws the evil out. And, bless us all, she does. Bathia reaches out her hand. But the good witch has no fear. And that’s when this unholy rite turns into something even darker — a call with Comcast customer service. 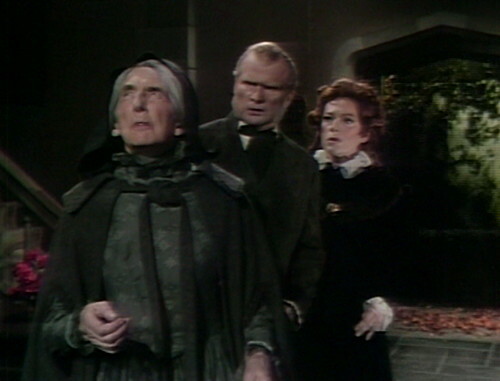 Barnabas: Why are you looking to cancel this curse? Bathia: We’re just asking you to cancel it. We want you to take it away. 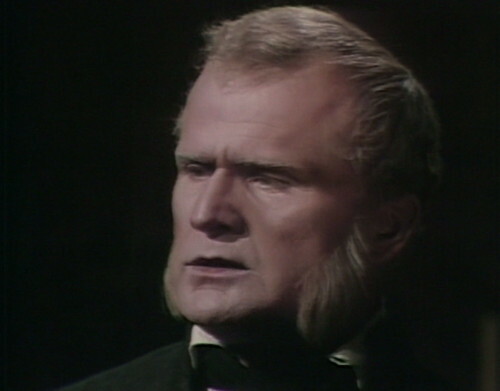 Barnabas: Well, if you want to get your curse disconnected, you’re going to have to go over this information with me. Bathia: Can you actually cancel this curse? Just tell me yes or no. 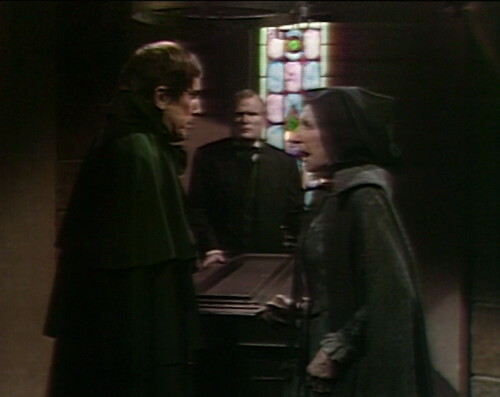 Barnabas: I mean, we are the number one provider of vengeance-based vampire curses in the entire country. Help me understand this. What is it about the number one rated vampire curse that you don’t want anymore? Bathia: That’s not your business. Your business is to disconnect us, please. 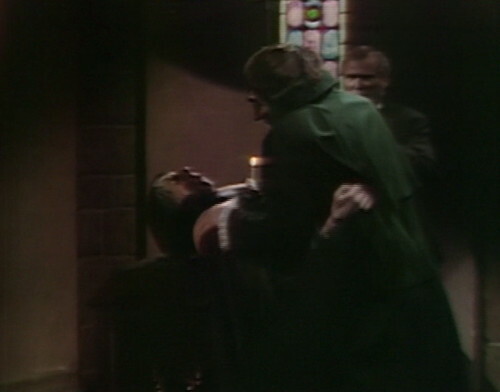 Barnabas: Look, I’m just trying to help you here. 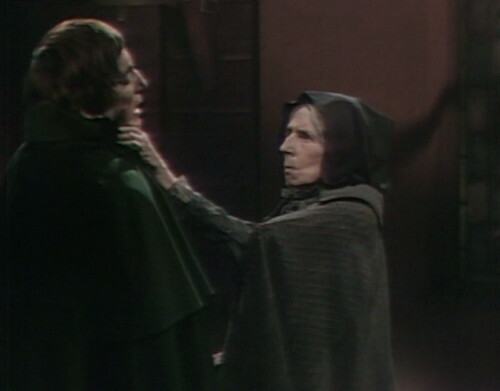 Finally, the conversation ends with Barnabas reaching up to strangle Bathia, which is actually kind of a relief under the circumstances. 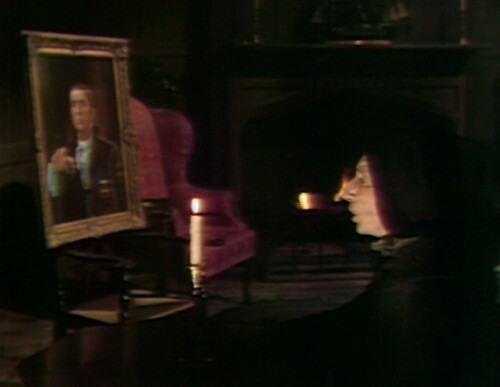 During the sequence in act 3 that cuts back and forth between Bathia’s incantation and Barnabas at the docks, there’s a moment when the camera switches to Barnabas while Bathia is still calling to him. 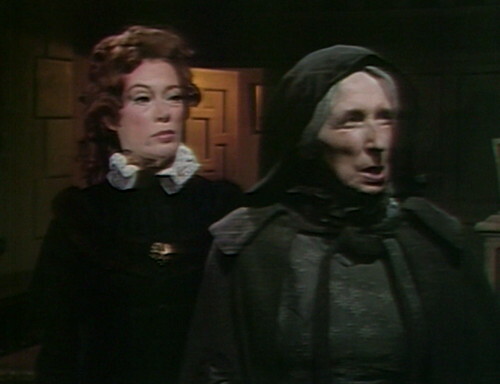 Her mic is cut for a moment, probably by someone who doesn’t realize that she’s still supposed to be talking while the camera’s on Barnabas. 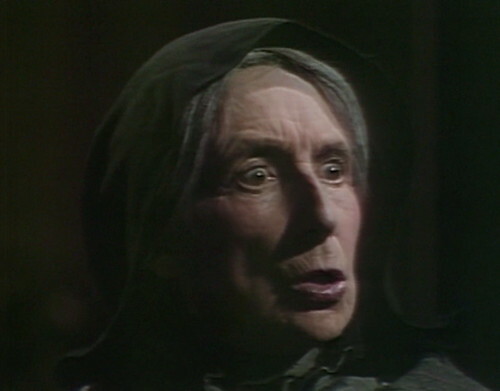 Bathia Mapes is played by Anita Bolster, a 72-year-old Irish actress who still had another ten years of acting ahead of her. Her first role was in What Money Can Buy, a 1928 silent film about a scoundrel who wants to prove that he can buy his way into a woman’s affections. From the late 30s through the 40s, she had small parts in more than 30 movies, including Scarlet Street, which was one of Joan Bennett’s major films. She also appeared in I Married an Angel, The Thin Man Comes Home, Dark Passage and Alfred Hitchcock’s Saboteur. In the 1950s, Bolster moved to television, and had roles in lots of British TV shows I’ve never heard of, including Man Against Crime, Rheingold Theatre, Let’s Stay Home, Hour of Mystery, and The Adventures of Brigadier Wellington-Bull. 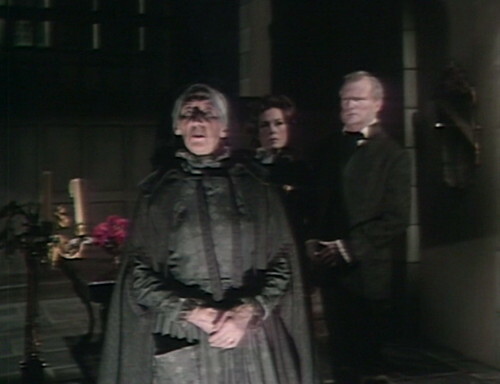 In fact, most of her credits are from the UK, both before and after Dark Shadows. 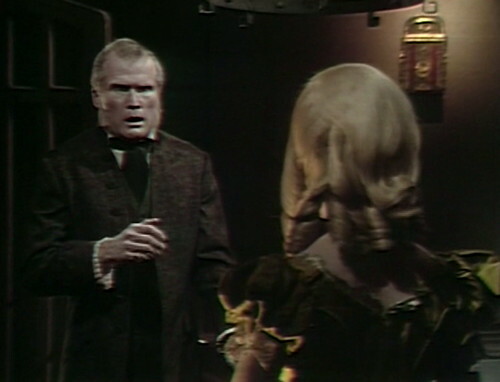 I’m not sure what brought her to New York for three days in March 1968, but we’re lucky to have her on Dark Shadows, because she’s spooky and surprising, and I think she’s great. After a fifty-year career in film and television, she’s only remembered by Dark Shadows fans, because of a fairly epic lapse in her memory that we’ll see on Monday. She kept going for another ten years after that, and she died in North Miami in 1985, at the age of 89. 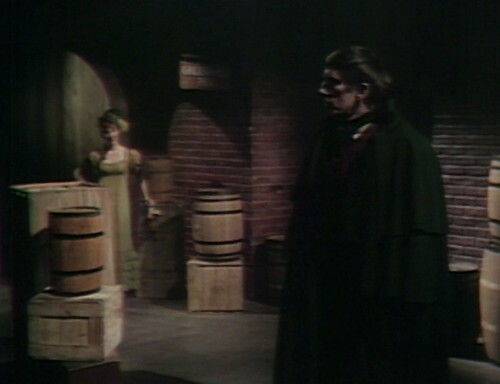 This episode also includes Rebecca Shaw as the streetwalker on the docks; she also appears in a couple weeks as a barmaid at the Eagle. Anita Bolster was a wonder. 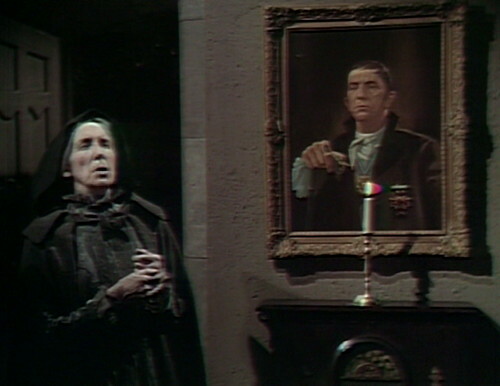 If you needed a creepy housekeeper, bitter spinster, or just plain weird older woman (and Margaret Hamilton was out of town), you got Anita Bolster. Her role in “Saboteur” was fairly typical: she played the bearded lady! Match-up I wish we’d seen: Bathia Mapes versus the caretaker. Irresistable force, meet immovable object. Interesting mention about a gypsy. Could she have been part of a gypsy caravan that was in the Collinsport area at the time the candle flame SOS went out? She musn’t have been far from Collinwood because she got there rather quickly – realistically how far could she have walked in a day? If she was a local I’m sure there would have been legends told about the ‘crazy witch living in the woods’. I guess thought came to mind because I’m at the tail end of 1897, where gypsies play a big part in several storylines. True, Collinsport is full of weird things just before all those Barnabas stuff ,Laura married a Stockbridge and died by Fire.So, Bathia is nothing strange why is that only Aunt Abigail was the only one that believe in witchcraft among the family on a consistent basis though she had the wrong witch..
Barnabas Goin to the docks whenever he is upset about something–this plays into the “vampirism as an addiction” trope. (He needs his hit!) So that would make Bathia Mapes a kind of twelve steps program? It would certainly make sense of her insisting that the Collinses admit the nature of their problem. Barnabas’ blood thirst, like Sarah’s power, and Natalie’s, and Angélique’s…is driven solely by narrative convenience. Indeed. Angelique’s powers in particular were all over the map. You done it again. I laughed until I CRIED! I may have even herniated, I’ll have to check with my doctor (if I can’t reach Bathia Mapes by candle call). 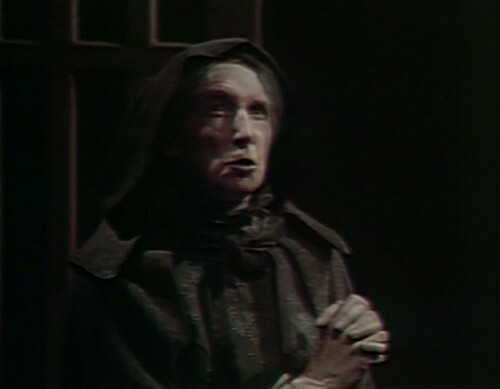 I think Anita Bolster was a talented actor. She was probably more at home in the movies where multiple takes are the norm. I think it was a mistake to have Angelique assume this level of evil. On the whole she seems to be driven by jealousy and rage than the type of raw malice we see here. This takes it to a whole different level and eliminates some of the character ambiguities on which the later drama depends.